Mahimagadi is the birth place of Mahima Dharma, situated at Joranda district, around 24 km from Dhenkanal Odisha. Santh Bhima Bhoi is the founder of Mahima Dharma. Lots of devotee called as Alekha baba are staying there. The Gadi Manidr, Dhuni Mandir, Jyoti Manidr & the Ashrams all are the attractive spots of Mahimagadi. Magha Mella known as Prabhu Prunima which falls on January or February month of every year, it is the greatest and attractive festival of mahimadharma. 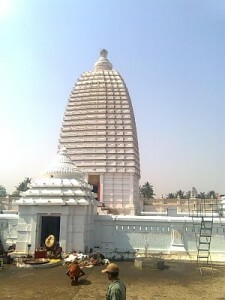 This temple is a unique temple built in area of meeting of three villages Joranda,Natima and Patna. The temple is dedicated to Surya as Shunya Gosain belonging to a sect of Hindus called ascetics of Mahima Dharma. The temple was built in early 20th century,but the shrine existed from early 14th century.It is the Samadhi Peetha of Mahima goswami, who spread the Mahima Dharma. The principles of the sect includes doctrines of Jainism.They think Bhagavata Purana as very sacred too.They respect all Gods.The sect belongs to a group of ascetics. As the ascetics of this sect are not supposed to spend more than two consecutive nights in one village,by staying at the meeting point one can change the position to other corner of Temple. It is a Rekha deula having some sub shrine and dedicated to Surya as Ananta, Nirguna Brahman. No image worship is done inside. Currently ascetics belonging to this sect saty here. Every year Maagha mela attracts lots of ascetics.It is located just 30 km North of Dhenkanal town. Give Responses for "Mahimagadi Joranda Temple of Dhenkanal"